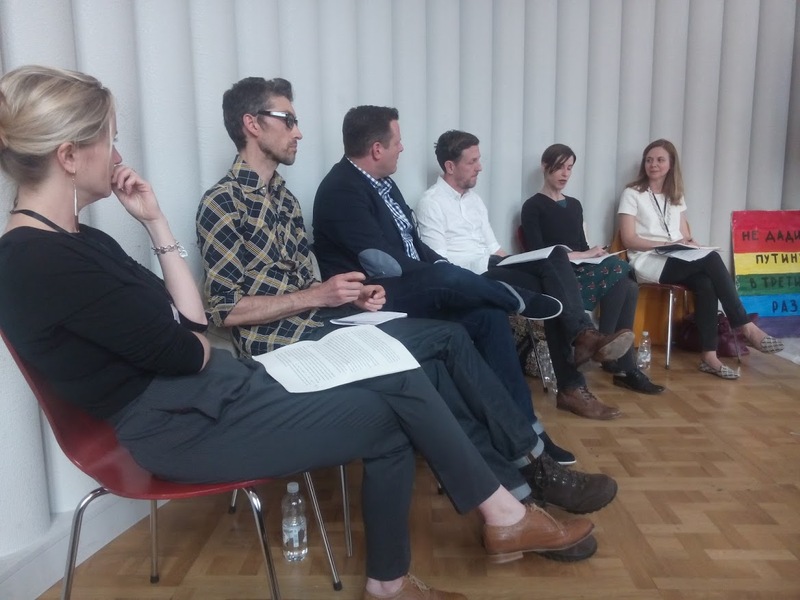 ← Design Culture Salon 21: Queer Craft…? The brevity of the title for Design Culture Salon 21 — ‘Queer Craft…?’ — belies the complexity of putting these two challenging concepts and practices together and the volume of discussion that this act generates. Both terms — queer and craft — offer destabilisations of categories and categorisation. And thus, the ensuing conversation may best be described as sinuous. It never moved in a straight line. Left to right: Catherine Flood, Conor Wilson, Matt Smith, Joseph McBrinn, Julia Bryan-Wilson, Laura Carderera, ‘We won’t give it to Putin a third time’, placard by Seroye Fioletovoe, Alexey Kiselev, Abubakr Khasanov and Nadia Tolokno, carried in a protest rally in Moscow on February 4th, 2012. Julia Bryan-Wilson, Associate Professor, Modern and Contemporary Art, University of California, Berkeley, therefore kicked-off the discussion with a corkscrew trajectory. Julia quoted an interview with the artist Gregg Bordowitz where he says, ‘I’m very much interested in queer things. Queer things don’t yield easily to comprehension. They refuse to recognize or be recognized. They work from, or occupy a place of shame or embarrassment.’ Extending from this, we might think of links between craft objects and queer objects as being deeply embedded in abjection or lowness, particularly in relation to the category of fine art. We may also see this in relation to both uneasiness and pleasure. To do craft is to doing something queer; to do something queer is to do something crafty. However, perhaps these claims might be too generalising, she suggested. The terms are unstable and by allowing an ellipsis (…) we might also allow a pause to interrogate them and their relationships. Queer craft has, to date, been dominated by textiles, and so by opening up the materials under discussion further, we can push the debate on. Even so, Julia Bryan-Wilson proposed that textiles has a particular relationship to queer politics: they mediate between private and public and structure bodily relations to the social. We are all experts in textiles, given our intimate and everyday relationships to them. Textiles activate desire. Joseph McBrinn, Reader at the Art and Design Institute, University of Ulster, began his position statement by arguing that historically, textiles have not always been a feminizing process. Think sailors or soldiers repairing their kit. Thus we need to be more specific about the registers of handiwork that we are engaging with. As Julia Bryan-Wilson had also suggested, Joseph McBrinn acknowledged that the crafts are not always aligned with liberatory impulses. The crafts have been taken up and appropriated into several nationalistic or fascist regimes as oppressive vehicles for ensuring adherence to specific traditions and outlooks. Folk and vernacular art were taken up in Vichy France, for example. A second note of caution that Joseph introduced to the debate was that queer theory, on which contemporary definitions of queer so often rest, is changing twenty or so years after it grew out of the feminist and the lesbian and gay liberation movements. Its continued relevance today, its recent “anti-social turn”, and its origins in elite American universities are widely debated. Definitions of queer should be taken in relation to this context. Meanwhile, the debate has moved beyond reclamation of self-respect, arguably, to discussions of feelings in a fractured world. Matt Smith, recently Artist in Residence at Victoria and Albert Museum and currently Honorary Visiting Fellow at the University of Leicester’s School of Museum Studies, argued for queer as having a double definition. First, this may be LGBTQ identification. Second, it describes a deviation from the norm. Craft and queer are both marginal situations in relation, in particular, to fine art and heterosexual normativity. While these marginalities may sit in relation to dominant positions, there is also an exchange that goes on between them. Making something is very personal, and has the ability for personalization; so, Matt argued, craft easily aligns with the making of identity politics. Craft objects can make a space in the world for alternative positions in nuanced ways. This nuancing makes it challenging to map any overall aesthetic sensibility for it. However, appropriation appears to be a common technique in it. It opens up multiple readings in its adaptations. It explores and deconstructs structures in society, allowing people to orientate themselves against these. It also opens up possibilities of hearing different voices and examining what interests are at stake in the construction of normative, dominant views. Conor Wilson, Artist and Senior Lecturer at University of the West of England, developed on the idea of intimacy in craft making. Closeness to the materials, their performance and shaping in the context of functional objects means, he argued, that they are what they are. They do not necessarily, as in fine art, carry any metaphorical role. This pulls on Object-Oriented Ontology, that Conor mapped out. Here, it is understood that there is a reality independent of human thought or language and we can only access this reality through speculation. Objects have a reality, therefore, and have a relationship with each other. Conor Wilson then drew on an account of loading a kiln with cups that he had made where he had not, as yet, tested his process with these. He was happy to afford the cups their own reality, as it were, and the contingent risk of not being able to fully anticipate how they would turn out. This is where the process, he suggested, gets queered. Catherine Flood, Curator of the exhibition Disobedient Objects, and Curator, Prints, Victoria and Albert Museum, drew a distinction between what she claimed ‘high craft’ and activist objects. In the latter case, the objects of ‘history from below’ may get left out of museum narratives but might – as LGBTQ objects can – disrupt the value systems of the museum itself. Catherine made reference to a placard that was made by a group of gay rights activists in Russia (see the object to the right of the photo). Taken out onto the streets of Moscow in 2012, it was the first time that the LGBT rainbow had been seen publicly. Clore 55, where the Salon took place, is in the middle of the British galleries, and Catherine Flood was enjoying the disruption of this relatively raw object amidst the high craft of the many objects around it. The placard is quite battered and grubby and is at odds with the highly finished objects normally associated with the museum. We might consider this as a kind of ‘unfinished object’, one that is locked into on-going struggle and, indeed, change of itself rather than a finished piece. (For more on activism and unfinished objects, my article, ‘From Design Culture to Design Activism’ may be of use here.) It may be a failure in terms of the quality of crafting expected in a museum. Or we might turn this round and view other, high craft objects as failing in crafting social change. Objects such as ‘Gaybashers…come and get it’, a banner by L J Roberts carried in the City Dyke March, New York in 2011 can be hybrid, moving between street protest and museums, between being craft and protest objects, queering standard categories. From there the conversation, expertly guided by our guest chair, Laura Carderera, worked through a number themes. These included: LGBTQ representation in the museum and normative, heterosexual dominance in curating; whether queer theory has atrophied or has moved into many new areas; the pressure of high expectations following a history of invisibility; varying forms of representation through queer craft. However, in finishing, I want to alight on two issues that emerged in the discussion. The first initially appeared to come outwith the core of our discussion. This was regarding why there was so little representation of the background makers who are involved in the realisation of many art objects in support of the artist. As an audience-participant observed, at the cinema we get the complete credits of all involved in the production of a film. So why not in the making of the art object? This could not be a more timely question given the very recent publication of Glenn Adamson and Julia Bryan-Wilson’s Art in the Making that considers this in depth. If queer craft includes the disruption of hierarchies and structures and, thus, binary opposites of thinking and doing, acknowledging and exploring the collective work that goes into the production of art and other works may be highly relevant here. It challenges normative identities of individual artists. It may open onto new ways of conceiving of creative labour. A second issue that was raised came from another field of identity politics, ethnicity. Queer theory has largely been a western discussion, and the need to incorporate non-western views of sexuality and gender was raised, as was the need to discuss the intersectionality between queer and other identity categories, especially race. Be that as it may, I wonder if the kaleidoscopic, shifting and sinuous qualities of queer theory mean that any identity, individual or collective, is transient. As a result, it may be common experience for anyone to feel both inside and outside any given situation. As, currently, a more-or-less straight male, for me parts of LGBTQ politics are sometimes easier to understand or feel than others. Accepting that partiality is more liberating than disappointing. As with craft, it isn’t compulsory to get all of it, all the time. But it is equally impoverishing not to try and get some of it. This entry was posted in activism, craft, curating, making. Bookmark the permalink.